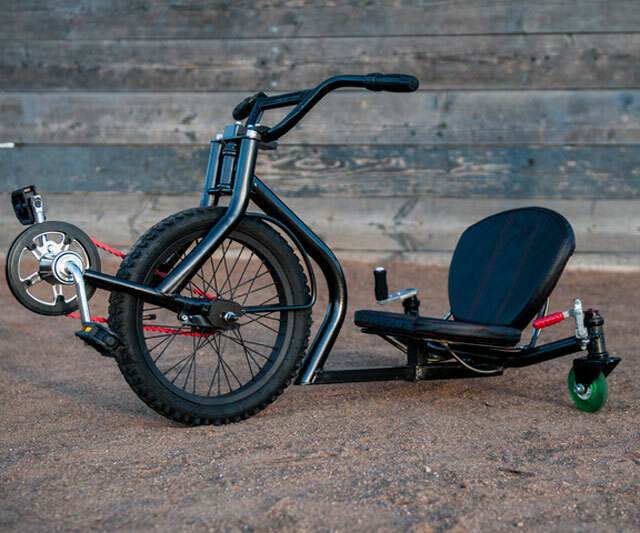 ONDA terms itself a recumbent stunt bike/trike that can also be used to commute to work. Commute to work? What am I, the imp from Game of Thrones? Cee Lo Green? I'm not willingly placing a 3-foot-high version of myself amongst throngs of people who tower over and could potentially squash me or else spill their $8 organic fair-trade pour-over lattes on my head. I'm just gonna keep driving to work in my non-electric POS that gets 12 miles to the gallon and save the ONDA for wide open spaces with plenty of room for spinning and drifting and accumulating Brazilian model spectators at the periphery. A minimalist design of a seat, 3 wheels, front and rear handlebars, and a wheel lock comprise the major components of the ONDA Cycle. The front wheel and handlebars enable basic steering like a regular recumbent bike (joking aside, I understand that recumbent bikes are the fastest and most efficient forms of manpowered transportation around; too bad they look like they belong in a ring with a bear wearing a tutu.) Smaller back swivel wheels add to the bike's repertoire of moves, and credit their control to the rear handle, which promises precise steering and trick execution. 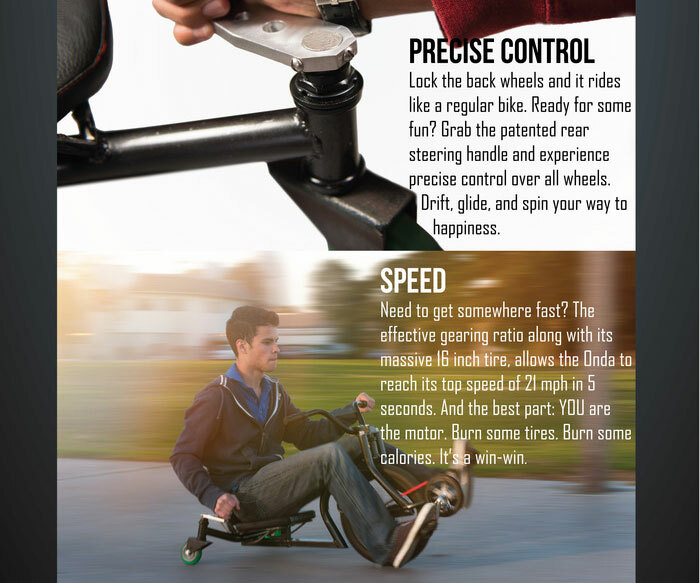 The wheel lock freezes the back wheels in a forward-facing position during basic rides and downhill adventure to preclude spinning out at high speeds. Check out the ONDA in action in the video above. Note: The action doesn't really start until 1:20. A machined, anodized aluminum rear-wheel steering handle. A 16" aluminum rim and heavy-tread rubber tire. Steel tubing for rugged durability. A coaster brake activated by pedaling backwards. 3:1 gearing ratio for speed. Freewheel hub for comfortable coasting. Thanks to Robert M. for passing along another Dude Product Tip. November 2013 Update: The ONDA exceeded its crowdfunding goal and, renamed the Leaux Racing Trike, is now available for direct purchase through the company website--follow the link below.